How has hotel design evolved in the past few years? One of the main things we are seeing in the evolution of hospitality design is the elevated importance of the lobby and public spaces as focal points of hotel architecture and design. These areas are especially important to the newest and youngest group of travelers - Generation Y. As the fastest growing segment of today's workforce and business travelers, this social, highly focused, and ambitious group is challenging our standard way of thinking about hospitality design. For this "instant gratification" generation who wants to be wired in 24/7, we have adapted our lobby designs - which used to be stopping points on the way to guestrooms - as a highly interactive and social area for the complete eat/work/play experience. This is now the space for collaboration, social networking, and the work area away from the office. One example of a hotel adapting to the changing needs of lobby design is the recently completed renovation of the Onyx Hotel, a Kimpton boutique property located in Boston's North End near the TD Garden. 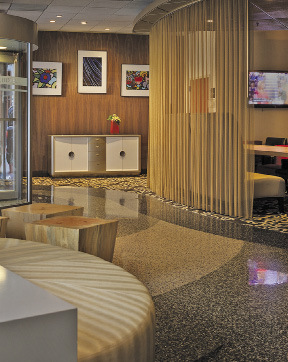 Group One was hired to "reawaken" the small 1,700 s/f lobby and create a more open space for guests. Taking into account the small lobby footprint, we created a seamless flow between the reception and lounge areas by using creative sheer screening and by changing the furniture arrangement so that the lobby was more visually unified. Our interior designers added new focal elements including a Murano glass chandelier at the bar, red leather cladding the bar facade, a sculptural glass installation at the front desk, and new furnishings and artwork to offer travelers a sophisticated ambiance for work and play. Unsurprisingly, access to free internet/wifi tops the list of the most sought after hotel amenities by guests, according to a 2014 survey by Hotels.com. As technology continues to allow travelers to work from anywhere in the world while maintaining their social connectivity, it has never been more important to look at the core of lobby design and reinterpret the way it is delivered to meet the varying needs and desires of our guests. In addition to travelers' need for virtual access and, therefore, a comfortable and well-designed space that allows for this, they also have a strong desire to connect with and have an emotional attachment to the properties where they stay. Today's travelers are more focused on staying at a hotel that provides them with a personal experience that they can take away with them. To accommodate these needs, we are customizing properties to give guests a unique, tailored, and personal experience that reflects both the brand and the hotel's geographic location. Art, sculpture, and, when appropriate, using historic/reused artifacts play vital roles as key architecture and design elements to enliven the lobby and public areas. The Residence Inn by Marriott Boston Downtown/Seaport is a prime example of a hotel using art and reused historic pieces to enhance its interior design and architecture - and most importantly, to immerse travelers in their cultural surroundings. A six-story hotel opened in June 2013 and located on Congress St. in Boston's thriving Fort Point Channel Landmark district, the property was originally developed in 1901 by the Boston Wharf Company as the Stillings Building. 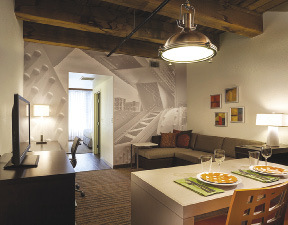 One of many adaptive reuse projects in its neighborhood, the property was transformed from a turn-of-the-century warehouse building into a hotel with 120 extended stay guest rooms. The goal of this historical renovation was to highlight and maintain the industrial character of the building while accommodating the comforts and needs of the modern traveler. 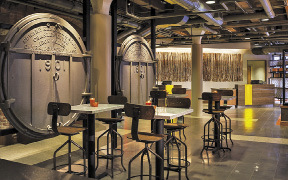 Using a mixture of the structure's original historic artifacts along with hand-selected and commissioned artwork in the public areas as an integral part of the design, the original, six-foot round boiler doors - dating back to 1901 - were repurposed as the focal point in the lobby dining area. In the meeting room, a wall-covering mural featuring Stillings Building vintage photography is showcased alongside commissioned art inspired by the Congress St. Grounds baseball field. Curated artwork and photography by local artists featuring Boston landmarks are displayed throughout the hotel lobby and public areas allowing guests to revel in the history of Boston as it is now and transporting them back to the Boston of more than a century ago. As part of the architectural touches, exposed brick and post and beam construction highlight the building's rustic and industrial character. The Residence Inn Fenway - Boston, an eight-story, extended-stay hotel located near Fenway Park and Kenmore Sq., is another property using art and the architectural creation of viewing spaces to showcase the city and create a rich cultural experience for guests. Opened in July 2013, this Marriott hotel features an expansive rooftop terrace space with partial views of Fenway Park and the city's iconic CITGO sign, a landmark of the Boston skyline since 1940. 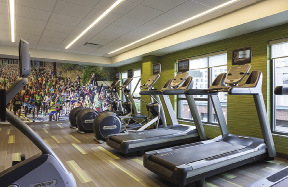 In the fitness center, a large wall-covering mural showcases hundreds of runners participating in the historic Boston Marathon, whose last leg of the 26.2 route takes place less than a half of a mile from the hotel's location. Lastly, hand-chosen and curated artwork and photography by local artists flanks the public spaces including images of Northeastern University, the MIT Dome, and the Pan-Mass Challenge. Corridor art, grouped together for impact, is presented as themes for each floor and features varying pieces of art for historic areas, colleges, and sports teams of Boston such as the museums of Boston, Boston Red Sox, Harvard University, Boston University, among others. Overall, as we are on the threshold of another evolution in hospitality design, we are experiencing the increased importance of public spaces and lobby design to meet the demand of modern-day travelers. To adapt to these needs, desires, and expectations, art, sculpture, and the reuse of historical artifacts and their integration into the architecture of the building play a huge role in providing travelers with a personal and customized experience and connection with hotel brands. By creating viewing areas and architectural elements to frame this art, we are immersing guests in their cultural surroundings by giving them a hotel with a personality and that celebrates its place in the world. Art is no longer just a pretty piece on the wall.